I don’t have time to read this ridiculousness, I just want the quick and dirty version to hand to my boss. *If you’re looking for further guidance on training or viewing or interpreting FEES, please consider joining our “FEES for SLPs” Facebook group. First, you must take an ASHA CEU approved Basic 2-day FEES course, FOLLOWED by the completion of a series of supervised passes under a QUALIFIED mentor. I’ve had some recent inquiries from people that think they just take the basic 2-day course and then they are “FEES certified,” whatever that means, and the answer is a big fat NO. You need someone to work with you for a few months to supervise you, show you the ropes, and help you perfect those stellar report writing skills. Fortunately, there are SEVERAL extremely qualified people out there who do an incredible job of teaching and supervising FEES, but unfortunately there are also the not-so-hots that don’t exactly understand the magnitude of the situation. So how do you know who is who? Obviously I do not know everyone, nor is it fair to make a blacklist, but there are certain requirements that YOU should take responsibility to look for and certain mutual expectations that should be set ahead of time when hiring someone to teach you to do this procedure. Why do I think it’s so important to find a highly qualified trainer? Good question. Well for starters? Several reasons. Not limited to but including: ethical reasons, legal reasons, medical reasons, shall I keep going? You get the point. ASHA recommends finding a mentor that has been doing FEES on a regular basis for at least a solid 2 years. This obviously can be spun in a million different directions, but let’s use common sense here. Would you rather have a mentor that has completed 2 FEES in the last 2 years or someone that does several FEES a week, and has been for a few years? I have heard of some facilities paying to have 1 SLP trained and then once that SLP is trained using that SLP to train the rest of the staff. No, no, N to the O. Manipulating the scope is the easy part, interpreting what you’re seeing is the hard part, and we’ll discuss that further. Whoever is training you to do FEES should be completely competent and extremely experienced themselves. We don’t want the blind leading the blind. That only hurts our profession and our patients. We’ve all seen and heard the complaints that some instrumental reports are useless and worthless, you don’t want to be on the other side of that complaint. We also need to remember that if a case went in to litigation and it was asked if you had proper training to complete FEES, and you show them your letter that you in fact were trained to competency by Nancy Knownothing, and when they question Nancy and she admits that she’s only done a few unsupervised FEES since her Basic course, you both could be toast. And I don’t see ASHA’s ethical board taking that lightly either. Please don’t work with Nancy Knownothing. This is a time for you to work with a highly specialized mentor, learn a great deal about the anatomy and pathophysiology of the swallow, learn to make the appropriate recommendations to improve your patient’s quality of life, and provide your colleagues with excellent reports so that they can provide evidence-based treatment strategies for their patients. Let’s also harp on report writing here while we’re at it. If you are one of those SLPs that is super particular about report writing (as you should be) and you want to make sure that you are trained to write an awesome report that provides your treating SLP with all of the information they need, don’t you think it might do you some good to ask what your trainer’s report might look like? Do you want someone training you to write these documents when their’s are absolutely atrocious? You have to remember that these reports are considered formal medical and legal documents, and if the person you hire to train you provides a very minimum bare-boned report, or if your mentor is NOT experienced, it will be awfully difficult for you to perfect your report writing skills which is pretty important to do considering this report will follow that patient around until the end of time. Let’s just imagine if you were in a horrible car accident and you went in to get x-rays of your shattered leg. The radiologist tells you that they think your leg is broken and you’ll need a cast. Well what exactly is broken? What exactly needs to be casted? How long am I non weight bearing? When do I start PT? What’s my prognosis? “We’ll I’m not sure, the only x-rays I’ve looked at before were of solid femurs, but I learned lots of anatomy during my 2 day Intro to Radiology class, so just wear the cast, and start walking when you feel better.” Wait, what?!? NO! This is what you are doing to yourself and your patients if you think its ok to start scoping patients after just taking a Basic class and doing a few “normals.” Again, it’s not just seeing an abnormal pathophysiology, or normal variant, or potentially malignant excrescence, it’s also being able to throw out the appropriate compensatory strategies during the study, making the appropriate recommendations for the patient and their family, and then write a comprehensive report that satisfies the physicians enough to keep referring their patients to you, which only happens once you do several studies on abnormal patients while getting ongoing feedback from your mentor. You have to remember that these reports are considered legal documents and will follow that patient around for several years to come, so it needs to be thorough, and you will only know what “thorough” means if you’ve been trained by an experienced endoscopist. So now that i’ve got you shaking in the knees, let’s get to the meat and potatoes of the matter. Starting with the arbitrary, unofficial guidelines from ASHA, which are somewhat understandable considering the subjectiveness of this competency, there are NO specific, hard and fast rules to becoming FEES competent, only guidelines. Certain states however DO have specific guidelines, so please be sure you are aware of your state’s requirements. A basic 2-day FEES ASHA approved CEU course – there are several of these offered all over the country, and you can check this page for the most updated courses, but your basic 2-day FEES course should provide you with AT LEAST 10 hours of formal class instruction, most are upwards of 15 hours. (Click here for ASHA’s suggested training curriculum)The 2-day course should also include several hours of passing the scope, usually at the end of the second day. You should be able to pass the scope at least 10 times during those “lab” hours. The course presenter should provide a head model for you to practice on as well. Unfortunately, I’ve known several people that have attended 2-day courses, but did not feel comfortable enough passing on their peers, so they completely passed on getting the passes! That’s a lot of wasted dollars! With the courses that I’ve assisted with, I wont hesitate to tell someone to go back and practice on Dead Head Fred a few more times, just to get a little more comfortable navigating the nostrils and the toggle. There is absolutely no shame in it, everyone gets comfortable at their own pace! I would also ask how many passes you will be able to get during those few hours, 10 is a good, solid number, which will also allow you to observe several passes. If there are 50 people attending the course, and 1 set of equipment and 1 instructor, then the odds are that you’ll be spending your Sunday waiting in line and not scoping, and you may want to find a different course. If it is a larger class, make sure to ask if there will be several sets of equipment available as well as several trainers to provide hand over hand instruction should you need it. I find that these first few hours spent scoping can really make or break a potential endoscopist. If you have an enjoyable learning experience, you will most likely want to continue scoping. If you’re shaking in your boots, not getting good feedback, and hurting your friends, you probably will not want to do this to your patients or follow up with training to competency. This time is also what you make of it. Don’t be afraid to get as many passes as possible during this time, this is what the trainers are there for! Completion of supervised passes to gain competency – this is where the waters get muddy. I’ve seen recommendations for anywhere between 15-50 supervised passes before achieving competency. This is an extremely gray area, but not one that you want to mess with. Again, check your state guidelines for this as some have specific stipulations. If your state does not have specific guidelines, then it is up to you and your “mentor” to set expectations as to when and how you will be deemed “competent”. Depending on the amount of normal passes you had during your 2 day course, your mentor will assist you in getting a total of 25 normal passes before moving on to approximately 25 “abnormal” passes. The conversation about achieving competency between you and mentor should be ongoing. DO NOT hold your mentor to a specific number because you may be Superstar Scoper and only need 15 supervised passes, or you may need a little more guidance and a lot more passes. It doesn’t matter EITHER WAY! All that matters is that you don’t feel pressured to be perfect from Day 1. You are learning and your mentor recognizes that. As your mentor loosens the reigns and allows you more independence, you will have a better idea of how many more you will need to do. It is also important to understand that during your competency training with a mentor, you will learn further and more in-depth passing of the scope as well as interpretation of the study and some documentation pointers. This is the time to really hone your report writing skills! Then you will scope your peers hopefully up to 10 times. Once that is achieved, you will need to find a mentor to supervise you through approximately 25 (potentially 50?) passes of ABNORMAL patients where you will demonstrate independence with scoping, recommendations, and report writing. So lets back up and define abnormal. It is NOT your brother, sister, husband, rehab director, or pet turtle. The additional 25 abnormal passes should be done in an actual real life setting, on real patients either in a nursing home, acute care, or ENT office. The easy part is learning to pass the scope, the difficult part is actually interpreting what you’re seeing, and making the appropriate recommendations. If you don’t have any practice with acutely ill patients that are on a vent or have a trach or an NG tube for example, you will be in a horrible predicament when that time comes, and you have zero experience with it. Sure it’s great to get a million passes on Dead Head Fred and on all of your closest friends and family, but if you want to be an outstanding FEES diagnostician, which any SLP seeking to do this should, then you need to have exposure to several acutely ill patients. You need to find a mentor that you trust that can get you that exposure. Shadowing someone for 2 days in a SNF or ENT office is not enough for you to competently and independently pass a scope. You need to have ongoing training for several weeks/months as well as access to someone that is willing to look at your images and your reports and make sure that you’ve identified all of the pathophysiologies and made appropriate recommendations. Ok, so as I harped on in my first post on compensatory strategies, once you’re comfortable passing the scope on Dead Head Fred, and then once you’re comfortable scoping your friends, and then once you’re comfortable scoping strangers, and then once you’re comfortable scoping acutely ill patients, then you need to get comfortable implementing compensatory strategies at the drop of the dime, making recommendations, and perfecting your report writing. This may involve studying up on the strategies and knowing when exactly to implement them. You need to be able to identify what you’re seeing and make recommendations appropriately. It’s all great if you’re the most perfect passer in the world, but the minute you get to the vocal cords and you don’t seen the gigantic polyp staring at you and you don’t make the proper referral and someone else does, and then the ENT finds it 3 days later and wonders why the heck you didn’t mention it, then you’ve got some explaining to do. Now, how do I find this picture perfect mentor? If you work in a hospital setting, chances are that a colleague will be able to do this for you. Most hospitals have programs and competency checklists of their own for which you will need to abide by. If you are working in large hospital system, you may need to meet with the medical director and see if there specific clearances, approvals, or credentialing processes that you need to complete. If you are just starting a FEES program in your facility, your proposal should have training for competency budgeted in, or at least request a separate quote for that. The instructors from the 2-day course that you attended should be able to put you in contact with SLPs that are doing FEES regularly, and have contracts set up where they can provide supervision. I do not want to discourage you from seeking out a mentor at an ENT’s office, I would just be sure that the supervision is done by an SLP. Some ENT’s have no concept of the swallow, and it may not be the best instruction for you. Once you’ve found your magical unicorn of a mentor, there are several things to discuss up front. What expectations do you both have? Will he/she come to your site? Are you expected to go to theirs? How many passes can you expect to get over a certain time period? Will you be seeing 1 patient per day spaced out over several weeks or several patients per day? How much report writing will you do? Will you do it together or will be expected to take it home and do it on your own? What do their reports look like? If you think their reports aren’t worth the paper they’re written on, do you really want that person training you? Do you have insurance to protect yourself in case you break the scope? Who is responsible for damages? You or your trainer? Make sure this is spelled out. If your company is paying for your training it will be during work hours, but if you’re pursuing it independently you may need to take several days off to complete your training. Make sure there is an understanding between both parties there as well. Will they still review your reports/images or cut you off completely? As you can see, there are several things to discuss. Absolutely none of these should intimidate you to not want to pursue FEES, just things to be completely transparent about before forking over thousands of dollars for training. Now it’s time to discuss the gigantic elephant in the room… cost. No, nothing worthwhile in life is free. I hear many SLP’s say that they want to get FEES trained, but they can’t. No, you can, you just may have to use that thing that sits on top of your shoulders and be creative, and make a plan, and put it in to action. IF you work in acute care currently WITH an active FEES program, you should be able to get training through a mentor at your facility. You may have to pay for yourself or use continuing education monies to attend a 2 day Basic course for the initial training and passes, but if you have an experienced endoscopist at your hospital, you could be in good shape for mentorship. If you work at a hospital that does not have a FEES program, PERFECT! This is your time to shine, superstar! (I’ve gotten about 10 messages this week asking me for suggestions for leadership activities for the BCS-S… hint, hint, hint!) STARTING a FEES program at your facility is an excellent way to get trained! Most equipment companies have partnerships with SLPs to offer on-site training as part of their quotes. If you are going to collect quotes to present to your boss, MAKE SURE you request a quote for the training as well, do NOT assume that it is included. Now if you work for a SNF getting trained may be a little more difficult. Again, NOT impossible but you may want to ask yourself why you want to be trained in the first place. If you just want to do it to do it and you wont actually be scoping at your SNF, your time and money may be better spent elsewhere. NOT telling you not to do it, but hiring a mentor costs a lot of time and money. There isn’t just the time spent scoping, but also the time spent with the clinician setting up, reviewing the chart, reviewing the recommendations, and critiquing the report. It is something that takes a lot of time over days/weeks/months to be comfortable doing, so if you have no desire to actively use the training for many years, you may want to wait until you will use it, so you don’t, you know, lose it! So that leads me to my next point. Many SNFs are hesitant to purchase the equipment due to turnover in staff. I have seen facilities that have equipment and no trained SLPs, because the SLP they paid to have trained left for a better position. IF the facility decides to invest the money on a system and training for you, do NOT be surprised if they require you to sign a non-compete since they are in fact paying for your training. If you don’t want to sign the non-compete you may not get trained. They are spending $1000s to get you trained and don’t want you leaving for a different position with your new found training a month after they invest the money on you, because now they may have to shell out a few more $1000s to get the next person trained, or let this $25,000 shiny new Cadillac sit in the corner and rust. The standard is about a 2 year non-compete, so if you plan to stay there the 2 years, then its no biggie. If a non-compete does not stand in your state, they may ask you pay back a pro-rated part of the training costs. Do not be intimidated by these conversations, just be aware that they may occur. But, don’t just take the training and run, it’s not cool, nor fair, and rather unprofessional. So what does it cost to become competent in FEES? First, as we discussed, the 2 day basic course, runs a cool $400-$600 per person, approximately. Several companies will also come to your site and do a private course for you and your colleagues, and that can cost upwards of a few $1000s. HOPEFULLY, at your basic course, you are able to get in a GOOD amount of passes on Dead Head Fred and then also a solid 10 passes on your peers, which will save you money in the long run! So now comes the expensive, but worth it part! Remember your mentor is taking time off from their day job to spend time helping you improve your day job, so it can add up! The time it takes to set up, review the chart with you, perform the assessment, interpret the study, and write the report usually takes a SOLID 2 hours when you are first starting, sometimes closer to 3 if report writing isn’t your strong suit yet. Now remember you need to do this about 15-25 more times (AT LEAST), so that adds up quickly! Thats about 45+ hours of direct supervision time, plus several weeks of “distance learning” where you still may request feedback on some interpretations/report writing, so it will cost you or your facility a few thousand dollars for you to complete your competency, ON TOP of the cost of the basic course. There are a few ways to calculate this cost. Some companies or mentors will have a flat rate for you to complete all of the passes until you both agree that you are now competent. Others will have a cost per pass. This can be much more cost effective IF you used your basic course properly and got tons and tons of passes there and feel completely comfortable passing the scope, and really just need to dive in to the abnormals and various pathophysiologies. If you did NOT use your basic course wisely, or you allowed months to pass before finishing your training, or you’re just a big scaredy cat with the scope, you may need a solid 30-40 more passes which at a couple hundred bucks a pop will definitely add up! It would also be very wise to have your mentor lined up to begin supervising you immediately after you finish your Basic course. As I said above, it can be quite a time commitment and most people have families and other obligations to work around, so don’t just expect to find your picture perfect mentor and expect them to drop everything and waltz over to your facility at the drop of a dime. You don’t want to take the basic course and then spend months finding a mentor, forgetting everything you’ve learned in the meantime. Do your research ahead of time, and have a plan in place. Let your mentor know that you plan to take the Basic course in September and would like to begin training to competency that next week. See? that wasn’t too difficult. *Another quick side note, in order for you to get the MOST out of your training, you will want to complete your passes and achieve competency within a restricted amount of time, say 2-3 months TOPS. If you do 1-2 passes then wait 1-2 more months to do more, you’re likely going to be forgetting a lot and just spinning your wheels. So again, make sure your mentor is able to provide that volume of patients for you if you are going to their site, or else make sure your facility has that volume of patients available at theirs. If not, again, you just may need to get a little more creative. One final note, make sure you obtain a letter of competency from your mentor when you are finished. Tuck that away for a rainy day with the rest of your professional documentation. You never know when someone will ask for that! So in closing, what if my facility won’t pay for my training? Well you may not like the answer, but you can pay for it yourself! I know plenty of people that knew that they wanted to do this for a living and didn’t want to be indebted to anyone or any company in doing so. It is a highly specialized training that is extremely rewarding, but hopefully you now understand why it isn’t a simple basic weekend course to become competent in performing FEES! 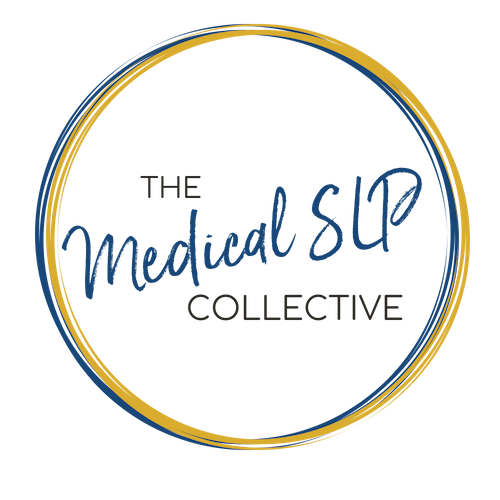 If this entire post is completely greek to you, or if you would just like some additional support while trying to stay afloat on dysphagia island, please consider joining us for the Medical SLP Collective. We provide brand new weekly resources in the form of handouts and videos, a panel of experts to answer ALL of your Medical SLP questions (anonymously, and not limited to dysphagia) and monthly webinars for ASHA CEUs. Sign me up for these stellar blog post updates. American Speech-Language-Hearing Association. (2005). The role of the speech-language pathologist in the performance and interpretation of endoscopic evaluation of swallowing: technical report [Technical Report]. Available from www.asha.org/policy. American Speech-Language-Hearing Association. (2002). Knowledge and skills for speech-language pathologists performing endoscopic assessment of swallowing functions [Knowledge and Skills]. Available from www.asha.org/policy.